Finding that special corporate gift can be difficult and there is nothing worse than giving your valued clients something they don’t appreciate. We can take the hassle out of corporate gift shopping with a gift that shows you value their business; a gift they will remember and tell their friends about. I would like to introduce to you our multiple award winning company Breda’s Delightful Baskets. Established in 1990 our company has been providing corporate gifts to prestige organisations for the past 30 years. One of our founding philosophies is to never compromise on the quality of our products and services. We pride in keeping our customers happy and provide the finest food products that have been hand sourced across Australia, personally by Breda. 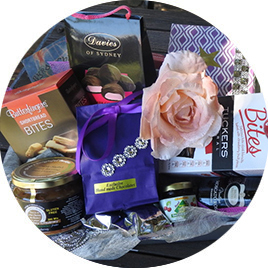 We offer tailored company hampers, exquisite small gifts and have a wide variety of signature preserves and chutney to showcase the excellence of your company brand, or to simply provide a personal gift. As industry experts we will guide you with the best knowledge in style, creativity and latest markets trends in delicious fine foods and wines. We have a wide range of products to meet your budget and we are proud to be recognised as agents of Australian Made and Australian Grown. When you next consider your arrangements for corporate gift giving, it would be our pleasure to assist you. Call us now 02 4296 3056 and secure the best corporate gifts that will be opened and always remembered! Chocolate Bouquets, making your gift giving easy and delicious! Hand-made, unique floral arrangements for yourself or as a gift! Corporate gifts that will be opened and always remembered! A memorable gift, an absolute delight to give and receive!